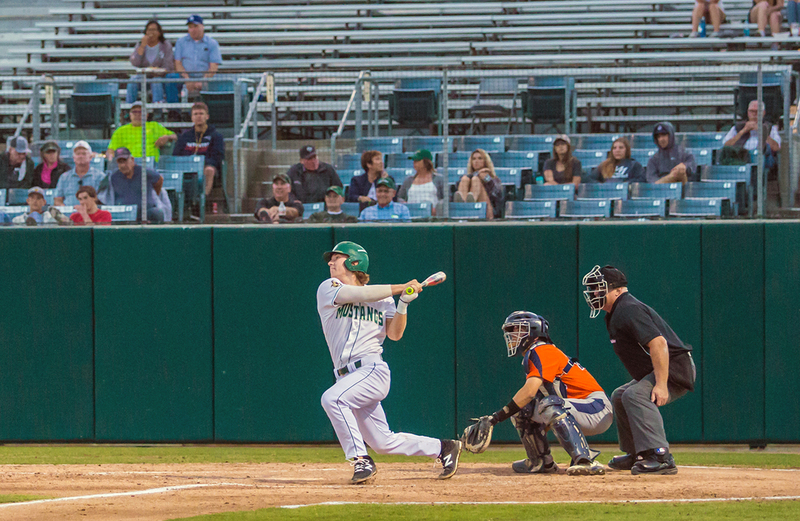 The Cal Poly baseball team dominated Pepperdine University in a 15-6 blowout Tuesday, May 15. Except for short stretches in the sixth and ninth innings when they gave up five total runs, the Mustangs racked up 19 hits and zero errors. The Mustangs got off to an early start, putting up one run in the first, two in the second and three in the third. In the fourth, they broke the pattern putting up seven runs. Junior centerfielder Alex McKenna provided the spark in the third with a bases-loaded triple to right center field that effectively put the game out of reach. Even though the Mustangs put up seven runs in the early innings, they didn’t slow down in the fourth. Freshman third baseman Tate Samuelson opened the frame with a double and senior first baseman Elijah Skips followed with a double of his own to start the rally. The Mustangs continued to get on base in almost every way possible, including an RBI walk by McKenna. With the bases loaded, Pepperdine third baseman Billy Cook rushed the throw on a routine ground ball and short-hopped the ball in front of first baseman Brandt Belk. Belk was unable grab the ball on the hop as it rolled around by the first-base dugout, allowing three Cal Poly runners to score. Mustang sophomore right-hander Connor Redmond made his first start for the Mustangs. He gave up just one run and struck out four as he picked up his first win of the season. He previously pitched 10 innings out of the bullpen. Junior left-fielder Nick Meyer provided support at the plate for the Mustangs as he recorded his first five-hit game of his collegiate career. Meyer and several other Mustangs played the night out of position because a foot injury to junior shortstop Kyle Marinconz from last weekend forced him to move to DH. This was Cal Poly’s last non-conference game of the season. In non-conference play this season, they went 15-18, including a 11-9 loss to Pepperdine April 17. Cal Poly plays their final home series of the season against rival UC Santa Barbara this weekend at Baggett Stadium before traveling next weekend to UC Riverside for the Mustangs’ final three games of the season.